Best Teacher of the World ! Home » News » Best Teacher of the World ! Marie-Hélène Fasquel, teacher at Nelson Mandela High School in Nantes, is the first French to have been selected among the 50 finalists of the “Global Teacher Prize”. The prize was awarded Sunday to a teacher from Quebec, with a $ 1 million dollars award, given since 2015 by the British Varkey foundation to valorize outstanding teachers from around the world! The only French among 50 selected candidates! And why not give the next prize of the “Best Teacher in the World” – the Global Teacher Prize, with its $ 1 million dollars donated by the VARKEY FOUNDATION – to those animated by passion, culture and love to the others, that organize annually educational trips to Paris, discovering classes with transversal and multidisciplinary teaching? The BVJ, a non-profit association founded in 1948 by a team of teachers, professors and educators, fully committed to Youth and Popular Education for more than 70 years, is an educational and cultural accommodation in Paris, utlra-central with a free early french breakfast in the center of Paris. Three genuine Youth Hostels that promote a different approach to being, things and teaching, through educational activities of cultural discovery in Paris and great visiting programs in Paris designed to encourage listening, exchanging and sharing! 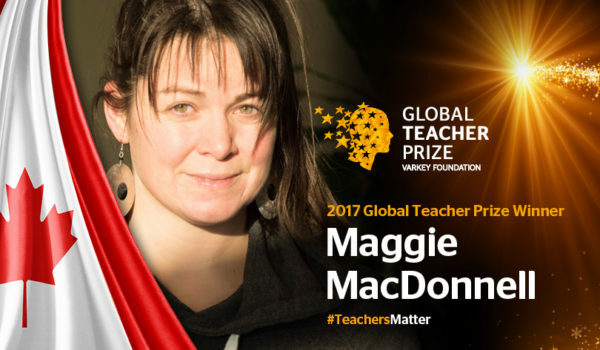 Maggie MacDonnell of Canada received her Global Teacher Prize award from Sunny Varkey of the Varkey Foundation. Maggie MacDonnell grew up in rural Nova Scotia and after completing her Bachelors degree, spent five years volunteering and working in Sub Saharan Africa, largely in the field of HIV/AIDS prevention. After completing her Masters degree she found her country was beginning to wake up to the decades of abuse that Canadian Indigenous people have lived through, including assaults on the environment and enormous economic and social inequality. As such, she sought out opportunities to teach indigenous communities in Canada and for the last six years has been a teacher in a fly-in Inuit village called Salluit, nestled in the Canadian Arctic. This is home to the second northernmost Inuit community in Quebec, with a population of just over 1,300 – it cannot be reached by road, only by air. In winter temperatures are minus 25C. Due to the harsh conditions, there are very high rates of teacher turnover which is a significant barrier to education in the Arctic. Maggie’s whole approach has been about turning students from “problems” to “solutions” through initiatives such as “acts of kindness” which has dramatically improved school attendance. Specific examples include: running a community kitchen, training and hiking through national parks to understand environmental problems. Who’s going to win in 2018?